Day five ends the first week of excavations at Glendalough and saw the end to the geophysical survey. During the second week students will still get the opportunity to carryout the drawing survey but on a much wider scale as the graveyard survey gets under way. The Geophysical survey has been taking place beside Trinity church just to the southwest of the car park. The students had spent the week carrying out two different types of geophysical surveying techniques. These were magnetometry and earth resistance survey. Before the students got a hands on experience of these techniques, some background information and description of the equipment was provided. During the few days students have had the opportunity to use both a standard resistivity frame for earth resistance survey and a 2-probe gradiometer for the magnetometry survey, both carried out along a 20m grid. As this was just a teaching exercise the readings from the magnetometry survey are not accurate as there was no avoidance of metal that would disturb the probe. Both of these techniques were carried out in the field that is now the location of both trench 11 and 12. Trench 11 and 12 today had seen great progress throughout the day with the weather holding strong. In trench 11 a sondage running along the length of the northern section was put in place in order to better understand the ditch feature picked up in the Geophysics along with the rectangular enclosure. Plans of the eastern section of the trench where a wall was once thought to have been was undertaken as well. The plough furrows were excavated as well to investigate any possible archaeology held within. Trench 12 had plans taken of the current present surface. Examination of the different soil colours revealed a possible few sections of plough furrows in rather strange shapes. Excavation of these plough furrows was then taken towards the end of the day to once again attempt to reveal any archaeology held within. 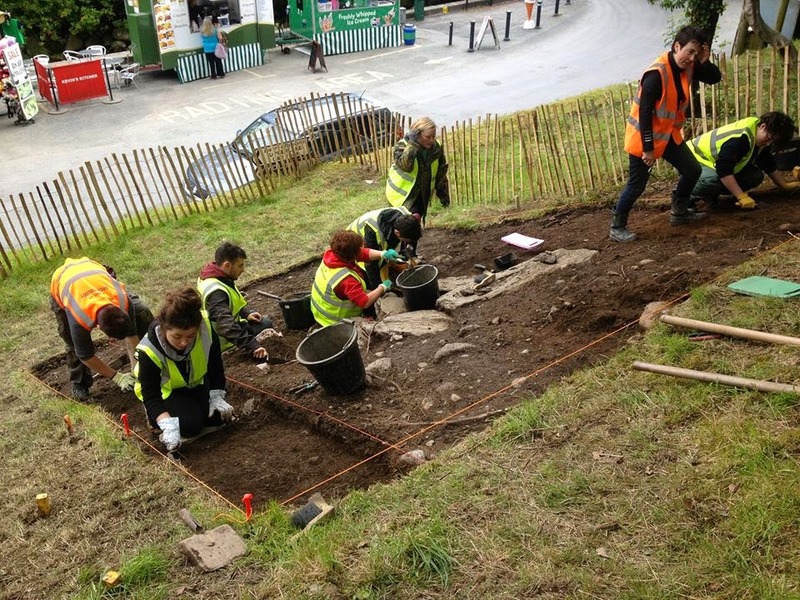 A fantastic end to week 1 of the Glendalough field school, with the weather holding strong and much progress being made through excavation we are one step closer to better understanding the Glendalough valley.